8 Questions with Lizzy Porter of Bee's Greens Company! We caught up with Lizzy of Bee's Greens Co. to learn more about her island farm in Waipahu, Hawaii! Freight Farms: What’s the story behind your Freight Farms project? Lizzy Porter: My Freight Farms project was born from an interest in the future and emerging exponential technologies, and developed into what it is today after learning about contemporary food issues in Hawaii. I learned about Freight Farms while on a path of learning about how existing big industries could be decentralized and democratized. I began to understand more about current food insecurity issues in Hawaii - where more than 80% of food is imported; where arable land can be hard to come by; where tropical weather can surprisingly and significantly impact a growing season. As an island in the middle of the Pacific, importing comes at great environmental and food quality cost. With the Freight Farms technology in mind, I found there was an opportunity to participate in a futuristic pursuit while helping with contemporary issues. Not to mention, I was pretty ready for an excuse to move to a beautiful tropic island. Thus, Bee’s Greens Company, operating in Hawaii for Hawaii, came to be. FF: What, if any, was your experience with farming before becoming a Freight Farmer? LP: Not much! I had a personal vertical hydroponic gardening system before becoming a Freight Farmer, but would not say I had experience with farming, let alone on a commercial scale. However, I grew up very comfortable with life sciences and technology so was ready for the challenge. I also believe that success often comes from delegating to others whose strengths complement your own - so was confident that if I was struggling, I could always find someone or a team with different skills and experiences to make the project thrive. Lizzy with her brother and dad, who help her out at the farm! LP: Surprise and genuine interest! I love that my answer is not traditional, whether I’m talking to someone on a corporate path, in the agricultural field, or pretty much any other avenue. It usually makes for a fun conversation about the future, unconventional passions, and potential solutions to contemporary issues - and inevitably ends up with looking us looking a dates to schedule a tour of the farm. Just one fun farmers market sign! FF: How did you find customers to buy your produce? LP: We’ve found our customers through farmers markets! We sell the majority of our greens to both patrons of the markets as well as other vendors at the markets. Other customers have come through by looking for like-minded companies. FF: What’s your favorite crop to grow and why? LP: My favorite crop is probably the Butterhead Rex. It is well loved here but doesn’t normally grow year-round, so the communities I serve are familiar with it and excited to see it when they hadn’t expected to. It’s also just the right amount of tender and beautiful. FF: What’s the most pressing issue in food and agriculture that you’d like to see solved? LP: On a personal and local level, I think a very pressing issue is food security in Hawaii. 80% or more of food is imported to the islands from 3000 miles away, which means quality loss, environmental costs, and an economic loop that is not benefiting the local community as it could. The challenge is that, because the imported produce is produced in very large commercial scales, it can remain cheaper than fresh, low impact, local food. With the global culture and awesome technology that we have in 2018, it is unrealistic and uncreative to just decide that a society can only have the food that grows well traditionally in that location. Things like the Freight Farms’ LGM provides a great opportunity for global selections of locally produced, consistent, high-efficiency, low impact goods. We completely agree with Lizzy! 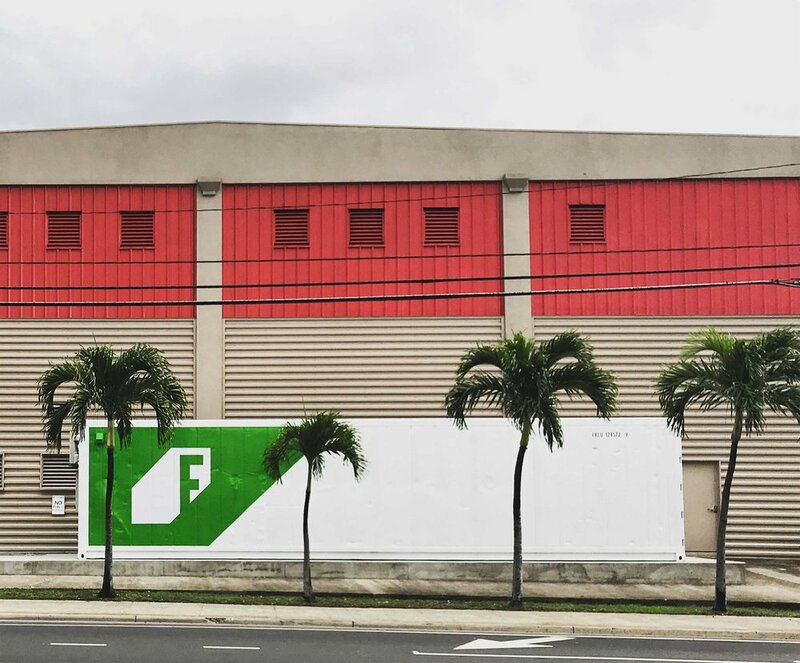 Check out our blog, Freight Farming Over Freight Shipping: Bringing Local Back to the Island for more insights into the problems island communities face today. LP: The most challenging part of this project was moving into a field that was relatively new to me, having never been involved in commercial farming before. The support of my family, the Freight Farms team, and the Freight Farms community has been absolutely instrumental in helping me overcome challenges of getting started and finding my footing. Now that we’ve been operational for a while, that support has been epically supplemented by the help and knowledge of great employees, and getting to share our stoke and passion with our customers and community. Lizzy working in her farm–you'd never know she didn't have any previous growing experience! FF: What’s the best piece of advice you can give to people interested in becoming Freight Farmers? LP: Passion is contagious, and I’ve found the best way to keep the stoke is to share it! A new business venture can at times be a grind, but if you can find the pieces of being a Freight Farmer that are most interesting to you – i.e. the parts that blow your mind - those are what you want to hang onto and share with others to blow their minds in turn. A significant amount of my sales and new connections have come from when I get on a roll, talking about how cool the system is, and why it’s important for now and for the future. Sharing my excitement and having it reflected back to me has been endlessly inspiring and motivating. Get to know Bee's Green Company by following them on Facebook and Instagram! Want to learn more about Freight Farms?